The chair seen below is typical of a Charles Mackintosh design. It was designed in 1904 and displays characteristics that are seen in many of his chairs. It is functional with some decoration at the back, which symbolises a tree but in geometrical form. Although natural wood (sycamore) has been used to manufacture the chair, it is distinctive because of its ‘black’ finished, to resemble ebony. Mackintosh applied colours including black and white to many of his furniture designs. A light coloured textile material has been used for the seat, contrasting the dark wood. 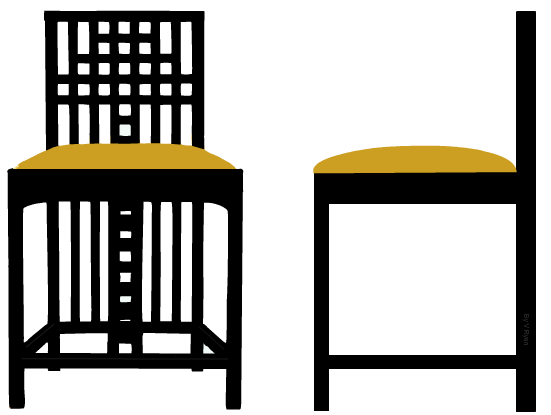 The powerful use of squares and rectangles as a lattice, is also common to Mackintosh chairs. Write an analysis of the Ingram Chair (1903), designed by Mackintosh. The follow keywords / phrases may help you answer the question.